Many clients have previously asked us for our recommendations for local artists that can help provide both bespoke and conventional Portuguese art for their new homes in Portugal; we are proud to be able to introduce Jessica Dunn as someone that could offer our clients the professional and creative assistance needed in this area. Jessica Dunn is a British artist who has lived and worked in Portugal for over 20 years. She studied Art Foundation at Kingston Polytechnic before moving to the Algarve to paint and enjoy the wonderful Southern sunlight. Jessica was also heavily influenced by her father the comedy actor Clive Dunn who provided her with the creative platforms during her formative years growing up on various T.V. sets to spark and cultivate her interest and passion in the arts. 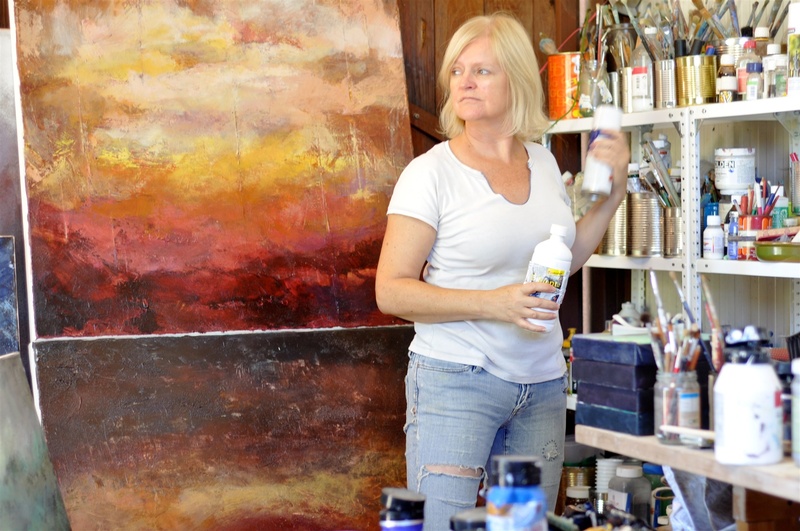 Over the years her work has gradually transitioned from the figurative to the abstract: textural impressions in acrylics - of land, sea and sky, influenced by the elements, intense sunlight and the drama of the landscape, constantly shifting and changing. Beginning with a rich dark ground, Jessica will move intuitively around the canvas with paintbrush and palette knife working from dark to light, layer by layer, back and forth, brushing on, scraping off, rubbing and layering over and over until the story begins to emerge. This build up of tones creates an impression of distance and depth, a focal point appearing organically. The works begin with an abstract idea, a feeling or mood and for Jessica it´s about the paint and the expressive marks which are made without too much pre-thought. They gradually evolve into something somehow recognizable, such as an imagined or remembered landscape, a sea or sky with a sense of foreground and distance. Ideally, the visual experience is also an emotive one, an illusion of being immersed in nature, of walking into a painting and feeling lifted. Galeria de Arte LiR, Lagoa, Portugal. Affordable Art Fair Brussels, Belgium. Hotel Tivoli Marina Vilamoura, Portugal. Museu da Mãe d’Àgua Lisbon, Portugal. Galeria Corte Real, Paderne, Portugal. Galeria Convento Espírito Santo, Loulé, Portugal. Biennale Internazionale Dell´Arte Contemporanea, Florence, Italy. Works featured in the Wall Street Journal online and Hello magazine. 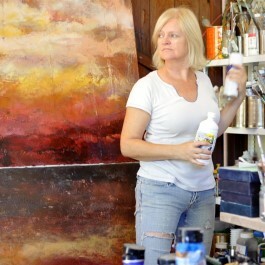 Please visit Jessica's website for further information and collection of paintings.